Any company that uses or stores flammable and hazardous chemicals in approved safety storage cabinets decreases their risk of devastating chemical fires. Approved safety cabinets pass a standard 10-minute fire test. The internal temperature remains below 325 F (163 C) despite the heat of the fire. Safety cabinets also help companies to organize their chemicals. Storing incompatible materials in separate cabinets keeps them from mixing and reduces the risk of unwanted reactions. Safety cabinets include a visible warning label that reads, "Flammable - Keep Fire Away." Justrite's reflective HazAlert™ labeling provide additional safety measures. When illuminated by a flashlight, the highly visible label alerts first responders or employees to the location of hazardous chemicals. Flammable safety cabinets also keep companies compliant with regulators. The Occupational Safety and Health Association (OSHA) issues fines for non-compliance. Investigators highlight chemical storage practices that fail to meet regulatory standards. An injury at a cosmetics company in Pennsylvania resulted in an OSHA inspection. The investigation revealed many problems with flammable chemical management. Fines accumulated to $285,300 for all the violations noted by the OSHA investigation team. Use double-walled steel with an insulating air space in the bottom, top, doors and sides. Weld or rivet joints (or another similar method). Doors must have 3-point latching arrangements and the door sill raised at least 2-inches (51 mm) above the bottom. Label safety cabinets "Flammable - Keep Fire Away." Justrite safety cabinets come supplied with dual vents, built-in flame arrestors and bungs. Cabinet venting is not required by NFPA 30. If the cabinet is not vented, the supplied bungs should remain in place as a seal. Always consult local fire marshals or inspectors for local venting requirements. Professional engineers, Environmental Health and Safety (EHS) Officers and industrial hygienists also provide valuable expertise. It is important to design a vent system that meets regulations, yet does not compromise the safety cabinet. Securing safety cabinets in earthquake and hurricane prone regions prevents them falling over. Optional seismic bracket adapter kits will secure any cabinet to a wall or floor. Never drill into the cabinet, as this will compromise the double wall design and its fire protection, along with its FM approval. Steel safety cabinets come fitted with grounding lugs. Although it is not required by federal regulations, grounding is advisable to eliminate a risk of static electricity. Static electricity is the buildup of electrical charge, which causes a spark. Grounding is even more important for dispensing or collection processes. Pumping out of a drum, or pouring waste into a drum funnel have the potential to generate static electricity. When these processes take place inside the safety cabinet, always connect the cabinet to an earth ground. In November 2017, a tragic incident involving static electricity occurred in a cosmetics plant in upstate New York. The blast killed one worker and injured dozens more. While filling a container, excess chemical spilled onto the container surface. Wiping the chemical away caused a static electricity spark - and the subsequent explosion. NFPA 30 - Flammable and Combustible Liquids Code. NFPA 251 - Standard Methods of Tests of Fire Resistance of Building Construction and Materials. All Justrite safety cabinets meet OSHA and NFPA specifications, and most are independently tested and approved by FM Global. 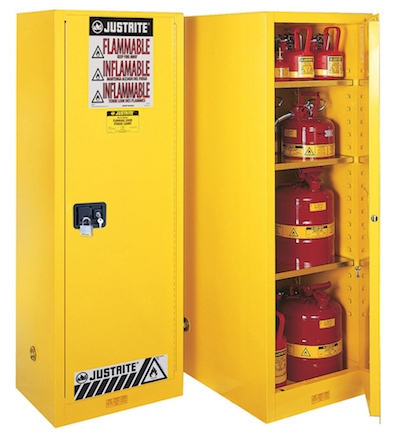 View Justrite's full line of safety storage cabinets for flammables and combustibles. Have special storage needs? We also offer fully customizable safety cabinets. EHSToday. Storage Cabinet Selection Made Easy.